Carroll’s Ally Gozum smacks a jump serve, in a nonleague high school girls volleyball match with visiting Greeneview, Sept. 15, in Riverside. Greeneview’s Ashley Schloss tries to block a shot hit by Carroll’s Meredith Schock (15), Sept. 15, in a girls nonleague high school volleyball match at Carroll High School in Riverside. Carroll’s Meredith Schock (15) and Sophia Carter (6) go up to block a hit by Greeneview’s Maddie Hines (3), Sept. 15 at Carroll High. Greeneview won the nonleague match in four sets. 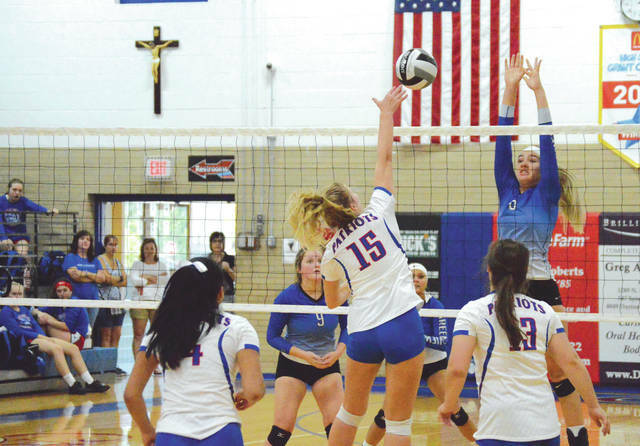 RIVERSIDE — Visiting Greeneview faced adversity on three occasions only to rally each time in a four-set win Sept. 15 over host Carroll. The Rams won a 25-23, 25-22, 20-25, 25-18 thriller over the Patriots. 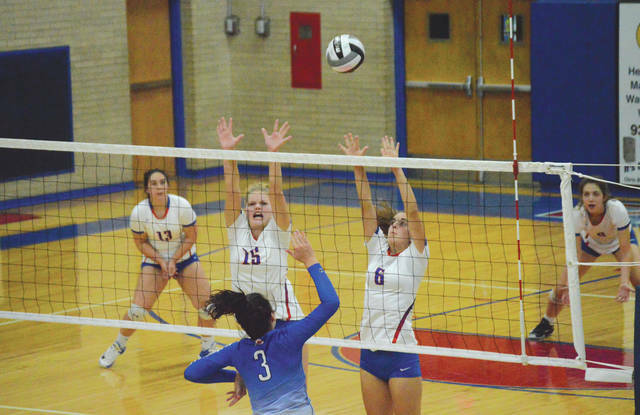 Greeneview (10-1) trailed by seven points in the opening set, was down by eight points in the second set before rallying for another win, then lost the third set, only to regroup and dominate the clinching fourth set for the match win. As rowdy as things can get in the confines of the Carroll High School gym, it’s tough for any visiting team in any sport to win there. But when Greeneview trailed 16-9 in the opening set, the Rams combined the service games of Maddie Hines and Bryce Ratliff with the hitting of Ashley Schloss and Grace Morris to go on a 14-1 run and the eventual 25-23 opening set win. After a Carly Cogan service ace in the second set gave Carroll (3-7) an 16-8 lead, Greeneview outscored the Patriots by a 17-6 margin the rest of the way. This time, it was serves by Maddy Cadwallader, Amanda Mickle, Caitlin Sweat, Hines and Ratliff that enabled the Rams to rally for the set win. Carroll broke a 17-all tie in the third set, capitalizing on a series of Rams miscues to stay alive with a 25-20 third-set win. Meredith Schock’s kill tied things up at 17, an Olivia Wright spike gave Carroll a 23-20 advantage, then a pair of Ram service reception errors enabled the Patriots to close out the third set. Three consecutive Ally Gozum service aces brought Carroll into an 11-11 tie in the fourth set. But after a Rams timeout, Greeneview led the rest of the way to take the match three sets to one. Schloss had a dozen kills and 14 digs, Mickle had a match-best 20 digs, and Sweat picked up 17 other digs in the Rams’ win. Carroll coach Rachel Krabacher appreciated Greeneview’s consistency. She said she’d like to see her players work to develop that same kind of consistency in the future. 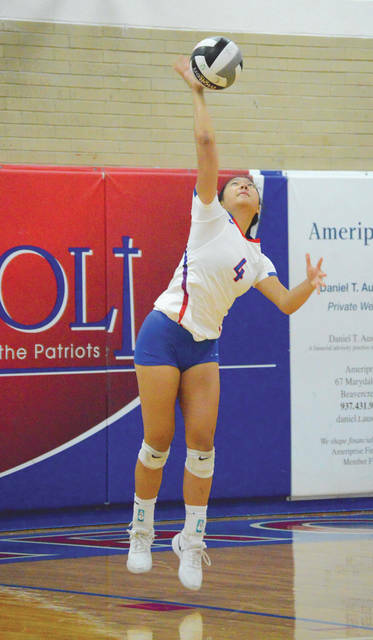 The Patriots lost the services of senior Mary Kate Fleisher midway through the second set with what appeared to be a shoulder injury and Krabacher wasn’t certain of the extent of the injury. Losing a senior starter forced Carroll to use a rotation of which the players were less accustomed, however. Greeneview hosted Waynesville on Monday. The Rams get back into Ohio Heritage Conference action at 7 p.m. Tuesday, Sept. 18 when they travel to North Lewisburg to take on Triad. Carroll returns to Greater Catholic League Coed play at 6:30 p.m. on Tuesday when they’ll host Roger Bacon.